Yesterday early morning, we reported that evidence of most awaited Facebook App for iPad was founded inside the iPhone version of app, and could be easily unlocked by simply hacking the application with use of tweak. In the first few hours of hack discovery many users run the hack and tried the application, but after few hours users start reporting that the hack does not works more, and they stuck on the login screen of the application. But thanks to the jailbreak community developers who always comes to us with amazing tweak and unlocks of several blocked apps, a new cydia tweak launched in the Cydia with name of “FaceForward” that let’s you to re-enable your hidden Facebook app for iPad, the tweak does not comes with any additional icon and settings, simply patches your Facebook application and re unlock the hidden app to work. 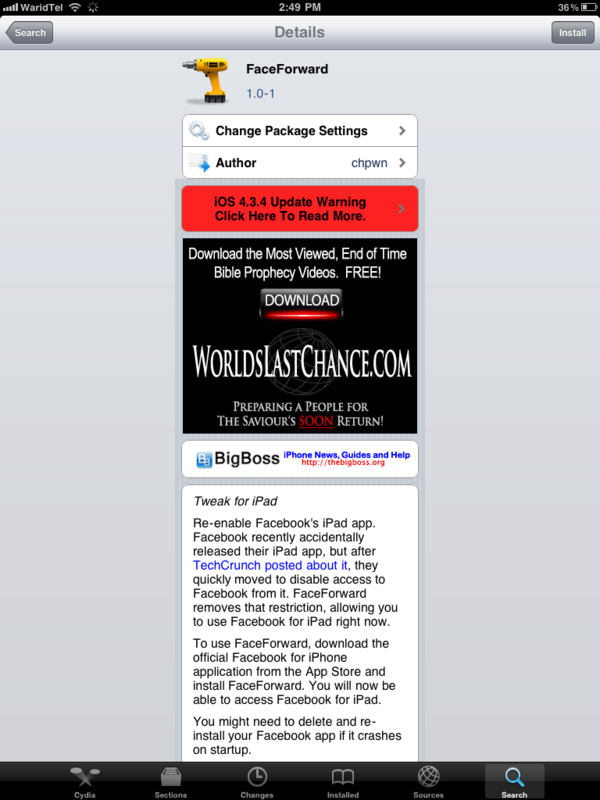 Personally we have tested the tweak “FaceForward” it launches in the Cydia at free of cost. To install it, all you need to do is refresh your Cydia, once the all packages refreshed, you will able to install the tweak patch. 1 – Open Cydia, and refreshed it’s all packages, once it has done downloading all packages. 2 – Search for the “FaceForward”, using Cydia search bar, and install it. 3 – After respiring, open the Facebook App and try to login again, this time the app will not throw you any error. 4 – If all the steps going well, than you will surely uses Official Facebook App for iPad.